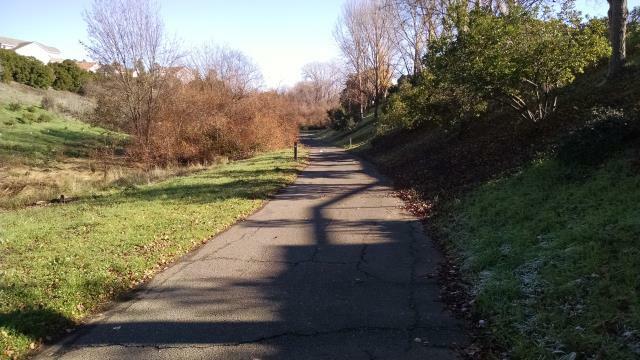 The paved trail between Wardlaw Park and Hanns Park follows Blue Rock Springs Creek and mostly flat. The Blue Rock Springs Trail joins several parks along Blue Rock Springs Creek. 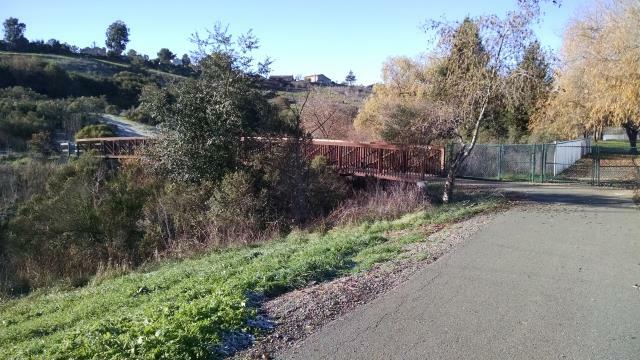 It's an interesting suburban trail that offers a mix of trail surface, terrain and environment. This means you can make pretty much whatever you want out of the trails here. The westernmost terminus of the trail is Hanns Park. Numerous shady Eucalyptus trees provide ample cover for the picnic benches here. A natural hiking path heads south of the main area through a small valley before emptying into an adjoining neighborhood. The outline of a home or building foundation sits in a small bowl surrounded by houses. Several bridges are dotted along the trail where it crosses the creek. The main trail heads west from the parking lot, following the eponymous creek. Because much of the trail follows the stream there's little elevation variation. On top of that, the the surface is paved. A few well constructed bridges make quick work of stream crossings. This section of the trail would be considered ADA accessible. Houses dot the ridges overlooking either side of the path. Wardlaw Park lies near the middle point of the trail and typically has better parking than Hanns Park. There's an off leash dog park here if you have a canine companion who would like to socialize with some other dogs. A bridge connects the park with the trail since they lie on opposite sides of the creek. Heading east from Wardlaw the paved trail continues. If you continue along the paved trail to the very end you'll find yourself in front of a locked gate with a golf course on the other side. This means you've gone too far. There is a trail junction a short distance behind that marks the beginning of a new trail type. Though there are trail posts that mark the spot where the junction resides, the rougher trail that connects is fairly obscure, at least compared to a wide paved path, and so may be easy to miss. The natural trail overlooks the Blue Rock Springs Golf Club and occasionally gets close enough that you could have a conversation with golfers teeing up. The single track hard pack path starts climbing uphill to work its way around the golf course. As it does so vistas are opened up to the north and east. The Sulfur Springs Mountain ridge in the distance serve as a backdrop for the well manicured golf links below. The trail does not venture far from the boundary with the gold course, so don't be surprised if you clearly hear conversations between golfers as they tee up. The rough trail portion descends from its higher perch as it empties out onto Lake Herman Drive. Though the gate here can be locked, it mostly likely remains unlocked during "normal" hours. Once crossing the road the trail splits into two directions and may, or may not take on a new name. To the north, the trail follows along Columbus Drive before ending in about a mile at Blue Rock Springs Park. This park is not always open and has an entrance fee. According to the park website, a trail heads up Sulfur Springs Mountain for some views over Vallejo and the napa River. According to signs at some trailheads, the trail split to the south goes all the way through to the shores of the Carquinez Strait. Coppertone had noticed this trail when driving by recently so we decided to come for a visit to check it out. We parked at Wardlaw Park near the center of the trail then headed west towards Hanns Park. The western part of the trail is paved and relatively flat. It follows the course of Blue Rock Springs Creek. It ends at Hanns Park, a place we had considered as a trailhead earlier in the day. But there were a few people milling about in parking lot that gave us the impression they were not there for a dose of nature, so we elected on Wardlaw Park instead. When we returned to our starting point we continued to the east on more paved trail, until we came upon a locked fence with a golf course on the other side. We missed the fork in the trail a not too far back. Though there are signposts for the split, it was not entirely obvious to us that's where we should go because the paved trail turns into a narrow packed dirt surface. Thus begins the "other" trail. The natural surface trail heads uphill and hugs the boundary of the aforementioned golf course. Occassionally you'll be just a stone's throw from someone's tee up. Whereas the first part of our hike was more of a walk, here the term hike aptly applies with some decent elevation changes. 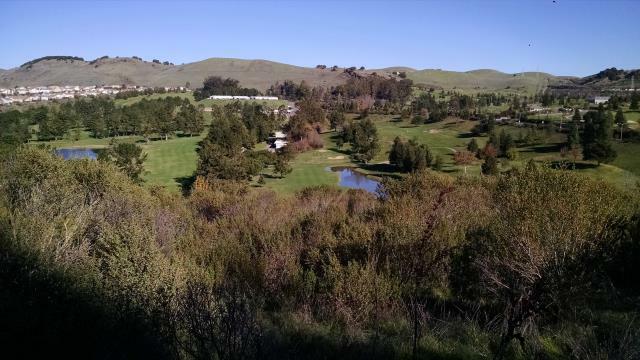 There are even some vista views looking over the golf course and beyond. We continued on this trail all the way to Lake Herman Road when we turned back and retraced our steps back to our starting point. We've had some freezing temperatures recently and non-sunny segments of the trail were still a bit frosty and icy. More than once our feet slid a bit underneath us, but thankfully never bad enough to cause a fall. Bay Area parks and preserves offer a dramatic variety of landscapes, from rugged redwood-forested canyons to breezy coastal bluffs, grassy rolling hills to sunny chaparral-coated hillsides. Well-known destinations such as Point Reyes National Seashore, Mount Diablo State Park, Mount Tamalpais State Park, and many other more obscure jewels of the Bay Area park system are just a short drive from the heart of San Francisco. Completely updated and including several new hikes and a complete new map set, 60 Hikes within 60 Miles: San Francisco guides readers to a splendid assortment of trails in the nine counties surrounding one of the world's most beautiful cities. Whether hikers crave a quick and easy get-out-of-town stroll or a challenging day-long trek through wilderness, this book is the perfect trailblazer, for city natives and first-time visitors alike.